Aqualand Portable Piers are second to none when it comes to quality construction, and attractive design. The piers offered here come in four foot by eight foot sections in either Powder Coated Blue Steel, or long-lasting, maintenance free Aluminum framing. Both come with attractive Cedar Decking standard. 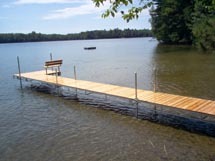 All Aqualand Portable pier sections come with two six foot galvanized pipe, Stay 'n Place Base Pads, White Caps, and stainless steel hardware standard. Shore anchors are sold separately. For assistance in designing your pier, or to get help on putting together a parts list CLICK HERE to e-mail Aqualand direct. You will receive a reply within 24 hours Monday Through Friday. AQ403 Blue Steel with Cedar Decking 4" x 8"
AQ611 Aluminum with Cedar Decking 4" x 8"
Accent, and add to your new Aqualand Portable Pier by adding a four foot by eight foot "L" section. Available in either Powder Coated Blue Steel, or long-lasting, maintenance free Aluminum framing. Both come with attractive Cedar Decking standard. 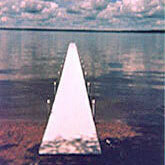 All Aqualand Portable Pier "L" sections come with three six foot galvanized pipe, Stay 'n Place Base Pads, White Caps, and stainless steel hardware standard. For assistance in designing your pier, or to get help on putting together a parts list CLICK HERE to e-mail Aqualand direct. You will receive a reply within 24 hours Monday Through Friday. AQ421 Blue Steel with Cedar Decking 4" x 8"
AQ625 Aluminum with Cedar Decking 4" x 8"
New from Aqualand is the Aqua-Ease Roll-in Pier System. 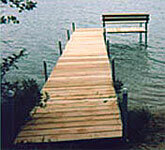 Designed by Aqualand, this systems makes removing and reinstalling you pier easy. Solid Aluminum framing, with a wide variety of decking options including, Cedar, All Weather, Aluminum, and maintenance free Vinyl, the Aqua-Ease Roll-in Pier System is perfect for that vacation, or second home. 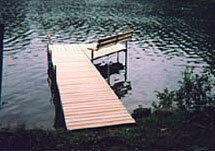 Now instead of having to wade out into the water to remove your pier, simply pull it out in the fall, and roll it back in in the spring. Aqua-Ease Roll-In piers come in a variety of combinations. Let us know what your needs are, and let us design a roll-in that's right for you.